If you are looking for the BEST BEACH in OSOYOOS ...this is it. Magical views from the front veranda. Immediate access to downtown (2 min walk). One step down to the beach. Roped off swimming areas. Private Hot Tub, BBQ, Volleyball net, Basketball hoop. Osoyoos is one of Canada's little known secrets. Insiders know that the Golf courses, Lakes and Wineries make this a holiday destination that has proven to be one of the top Vacation spots in the World. Walk to amusement park (mini golf, go-karts, etc. ), restaurants, shopping and Wineries. Guaranteed you will find many enjoyable and exciting activities for everyone. 4 Great Golf courses within a 20 minute drive. Hiking and fishing in the surrounding mountains. Site has plenty of room for parking. RV hookup is available FOR Extra Charge (water and power only)....45/nite. We have been coming to Osoyoos for 25 years. My parents retired here from Edmonton and we would visit them every summer. We originally bought a lot up near the golf course and planned to build. Then the kids came along and we realized we needed to be on the lake. We bought our first lakefront property in 1996 and several years later added this one. Both purchases were from the original owners who were still living in the homes. We have traveled and lived in, many beautiful places throughout Europe (Switzerland, Austria, Spain, Italy, Germany, etc.) and we keep coming back to the Okanagan. Osoyoos isn't as well known as some of the other lake communities but if you spend a week or two here you will have the answer as to why we choose to invest in our vacation properties on Osoyoos lake. One of few private rental homes directly on the lake in a central location. Lake views both North and South. Walking distance to all amenities. Separate studio suite has full bath with large shower, flat screen TV, and small separate bunk room. Tie up moorage for boat and sea doo Hot tub Basketball net and a Volleyball court in the water. The perfect spot of paradise for a family vacation! Thanks so much Kevin for another great stay. See you next year! 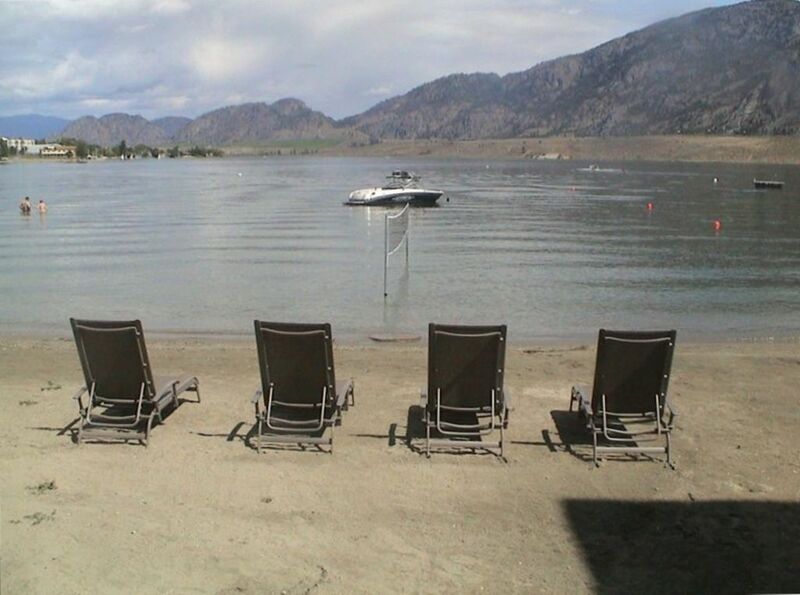 Very well located with beach, buoy and easy walking access to all our favorite Osoyoos spots. The visitors at hotels located on either side of the VRBO were very respectful of our space on the beach and water. The property was not as clean as we would expect at arrival and we were unhappy to be told we had to deal with the previous renters' excessive mass of garbage because of city's garbage pick up schedule. Third bedroom is also the laundry/cleaning tool storage area. The beach/water, private patio, hot tub and giant picnic table were enjoyed by our group. Owner is very friendly and quick to respond to emails. We appreciate the feedback ..especially regarding the cleaning. It is always a challenge for our cleaning staff to handle the turnover when there has been a very large group in ..especially when they aren't able to start the cleaning at check out time (this was the case before your stay) The cleaners will come back on short notice if they are made aware of any deficiencies. The garbage also becomes a bigger issue with bigger groups. Some rentals require the guests to remove their own recycling and garbage and also don't provide bedding in order to deal better with the short changeover window. We feel that would be a greater inconvenience than putting the previous guests garbage to the street. We do provide garbage tags for extra bags if necessary (town only takes one container).. Going forward, I think we are going to limit the number of guests to 8 so as not to have these issues. We are glad that overall you enjoyed your stay. Six adults and five children stayed there for two weeks. There is a very generous expanse of private beach; a hot tub, spacious house, ample sleeping area, a water volleyball net, and a short walk to an interesting little town. It was a really ideal spot for a family vacation and we would highly recommend it. The couple of downsides were that the 'yard' around the property should have the accumulated garbage removed and the smaller room in the guest house needs some work such as a new blind and a better air conditioning set up as it couldn't be plugged in. The property has a lovely, laid back ambience, the house has all the amenities and we made great use of the huge front porch. It was a lovely stay. Thanks Malcolm clan for the review and for the email with the feedback on the little improvements we can make ...we are always trying to get better. Glad you enjoyed your stay and we look forward to seeing you again. We came up with my young family the last week of June and had an amazing time. The beach is amazing, the main house was beautiful inside, the pictures don't do it justice. The metal septic tank thing on the beach wasn't that bad, it makes a quiet humming noise but it's off to the side so not a big deal to us. Property was very clean and the cleaning woman is very friendly. Owner is happy to answer any questions that you have. Will definitely be back next year. Stayed here for a little over a week, the location on the beach was great!! Very close to everything you could possibly need. Small hiccup when we first arrive and was rectified with in minutes. House was very nice, with modern finishes and relaxing. The only negative about this property is the guest house was a little dirty probably hasn't been used in a while, could use a good deep clean as per our guests for one night. once again I don't think you can get a better location then this and would definitely recommend to any family looking for a nice get away. We encourage guests to buy travel cancellation insurance. We can not offer any refunds unless we are able to rebook the dates.